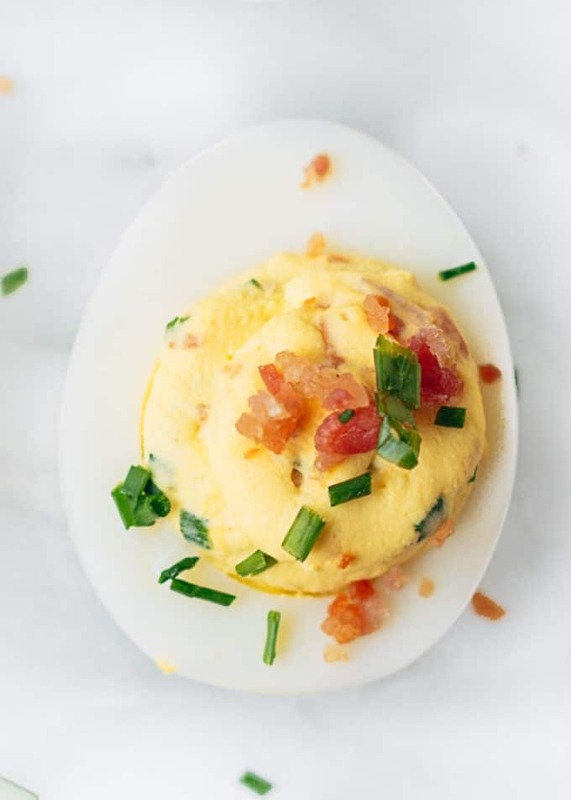 Filled with creamy egg yolks, smoky bacon crumbles, and zesty horseradish, these Bacon Deviled Eggs are a fantastic appetizer for game day, New Year’s Eve, or any occasion that calls for a snack with a little extra “oomph”. For a lightly spicy and smoky twist on the classic appetizer, these Bacon Deviled Eggs have become a fast favorite among my family and friends. A touch of horseradish in the filling adds a little “zip” to the bite, and snipped chives bring a fresh, mild onion flavor. These are deviled eggs to devour. As in my recipe for Classic Deviled Eggs, I start this filling with a combination of mayonnaise and sour cream, with a touch of mustard. I kept the Dijon in the recipe for its acidity, but reduced the quantity to introduce the heat of the horseradish (more on that below). A nice hickory or applewood smoked bacon is perfect for this deviled egg filling. I cook the bacon crisp in the oven, let it cool, and then cut it into a fairly fine crumble. We find that smaller, more uniform bits of crispy bacon are more pleasant than larger pieces when mixed into the creamy egg yolk base. I always like to make an extra strip of bacon to crumble over the tops of the filled eggs for garnish. More bacon is never a bad idea in my book! I like to use cream-style horseradish in this recipe, as opposed to fresh or the refrigerated prepared versions. My reasoning for this is that a.) cream-style horseradish tends to be a bit smoother in texture than prepared, and b.) prepared horseradish needs resting time in a recipe to fully develop its flavor and heat. While you can make the filling for these deviled eggs ahead of time, I don’t want to have to. Deviled eggs are the kind of recipe that I like to be able to whip up with short notice. Cream-style horseradish (my favorite brand is Inglehoffer; I buy it in the regular grocery store) is made from grated horseradish root and mixed into a creamy base. The horseradish’s spicy qualities are evident as soon as you taste it. Since this style of horseradish can vary significantly across brands, taste the one you’re using and add it conservatively, to taste, until you reach your desired heat level. Spicy horseradish can have a sinus-clearing quality, so I don’t like to to bombard my guests with a heavy hand. Yes and No. You can boil the eggs up to a week in advance, if you want to get a jump start before a party. 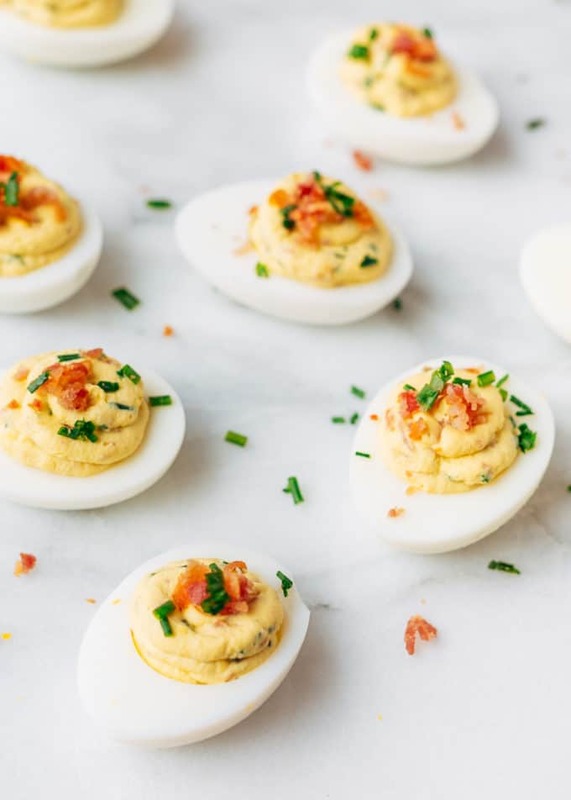 We like bacon deviled eggs best when we serve them pretty close to making the filling. The bacon will lose some of its crispiness and the chives wilt as they sit. The longest I’ve held them in the refrigerator successfully is 6-8 hours. After that, they’ve become a little lackluster. So, making them earlier in the day? Sure. Just hold the garnishes on top for right before you serve them. Prepping a day or two before? For the best flavors and textures, I don’t recommend it with this particular recipe. Read more about storing and transporting deviled eggs (as well as other tips for success) in my How to Make Deviled Eggs guide. Gently scoop out egg yolks and add to a bowl. 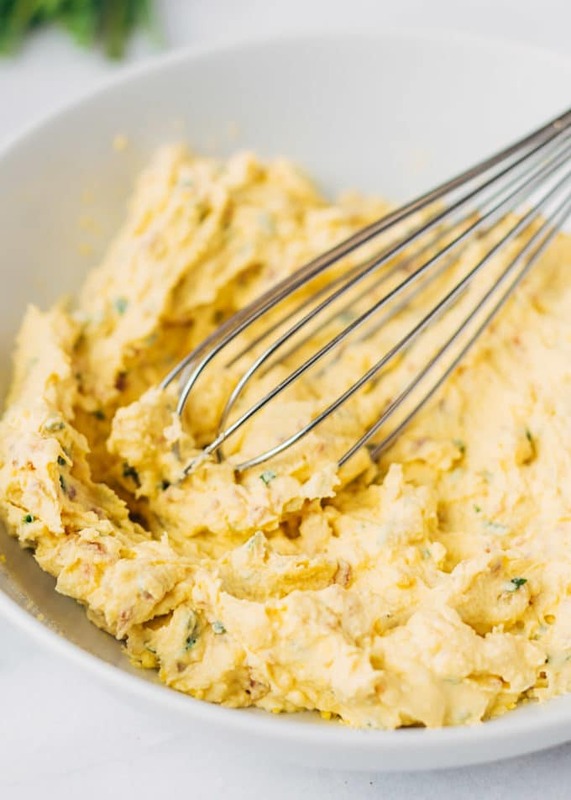 Whisk together with mayonnaise, sour cream, Dijon mustard, and cream-style horseradish until smooth (or use a hand mixer for a very smooth base). Stir in bacon and chives. Season to taste with salt and pepper, adding additional horseradish if you prefer a spicier filling. 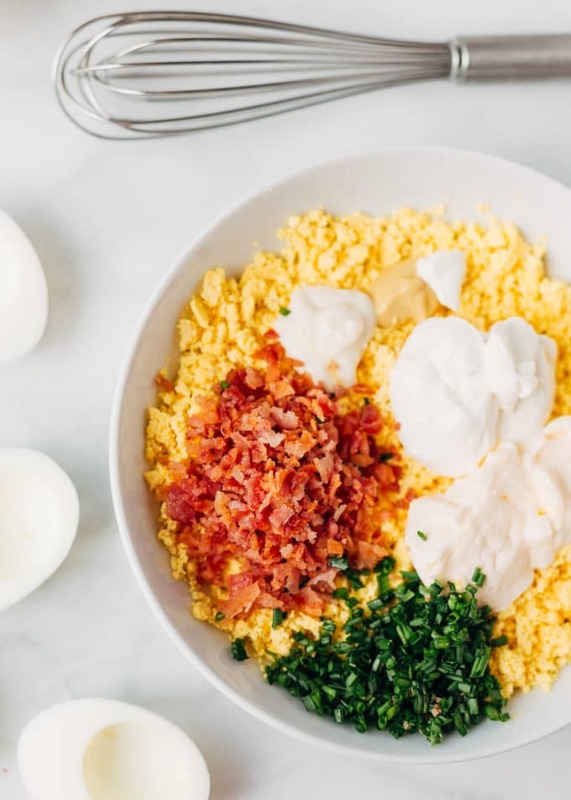 Fill each egg with some of the yolk mixture and garnish with additional bacon and chives. Fantastic idea! Dijon is wonderful to work with, but you’re definitely right about losing the heat with it. Bringing horseradish into the mix is a wonderful and very complimentary idea! And as for bacon and eggs – well, how can you go wrong there? Great advice on splitting up the work flow too – always good to know how best to do that with a recipe like this! Cheers. My husband is going to love these deviled eggs! He’s a huge fan of horseradish, so I can already see him asking me to make these over and over again. And chives and bacon are such a classic combination for deviled eggs. Yum!